Swing speed refers to the effect that bat weight (or MOI) has on the speed a bat may be swung in play. It plays an important role in determining bat performance and must be found empirically. It is readily understood that increasing a bat’s weight will lower its swing speed. It is not obvious, however, how much a given change in bat weight will change the swing speed. First one must determine which measure(s) of weight affect swing speed. There appears to be three schools of thought: bat weight, bat MOI, or a combination of the weight and MOI[e-h]. Bat performance is influenced by the swing speed. The ASA has conducted four field studies to better understand swing speed in the slow pitch (SP) and fast pitch (FP) game. The results of two of these studies (15 men and 36 women) will be reviewed below [i]. The swing speed field studies were designed using single-walled aluminum bats that were carefully weighted. Modern multi-wall and composite bats were not included in these studies. Modern bats provide enhanced performance and feel, but do not appreciably depart from the weight properties and swing speeds of single-walled aluminum bats. (The performance of modern bat design was observed in separate field studies.) Two groups of bats (SP and FP) had constant MOI, but varied in weight. Two other groups of bats had constant weight, but varied in MOI. A comparison of the bats used in the field studies is shown in Fig. 8.1. Fig. 8.1. A comparison of bat weight and MOI of the swing speed field study bats. Measuring swing speed is a challenging experimental task. A number of approaches have been employed and were considered including tethered sensors, radar, and light gates. A measurement was desired that would be minimally intrusive to the batter, yet accurately describe the swing speed. The studies were to be conducted in daylight on an outdoor playing field with a live pitch. This ruled out infrared cameras which are routinely used in batting cages with controlled artificial lighting. It also made light gates unsuitable as the bat-ball impact location varied widely with the batter and pitch. Optical high speed video cameras were found to have a sufficient field of view and resolution to track the swing speed, and were selected (Fig.8.2). They were placed above the batter so the batter’s natural swing was not impeded. Fiducial marks were placed on the bats which were subsequently tracked (frame by frame) in the video (Fig. 8.3). The bat’s center of rotation and rotational speed were extrapolated from the marker velocity vectors [j]. Fig. 8.2. Women’s fast pitch field study. 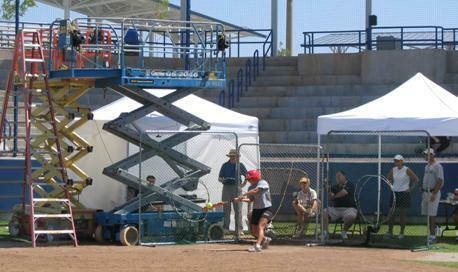 Note two high speed cameras mounted on scissor jack above batter. Fig. 8.3. Image from women’s fast pitch field study high speed video showing fiducial marks that were tracked to find swing speed. 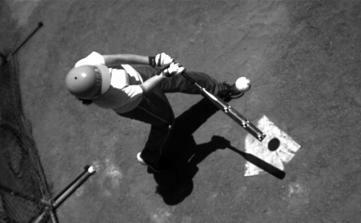 The center of rotation of the bat during impact was found to lie close to the center of the batter’s wrists. In the men’s slow pitch study the bat was often gripped at the knob. This resulted in a center of rotation a few inches off of the bat, away from the knob. In the fast pitch study, the women tended to grip the bat on its handle. Accordingly, the center of rotation was a few inches in from the knob. The average centers of rotation are depicted graphically in Fig. 8.4. Fig. 8.4. Average instantaneous center of rotation from fast pitch and slow pitch field studies. To compare the effect of weight and MOI, the ratio of swing speed to the average swing speed of each player was used, allowing the data of all batters to be averaged, independent of the batter’s ability. (The effect of player ability on swing speed, independent of bat weight, was considered separately.) Swing speed is shown as a function of bat MOI and bat weight in Figs. 8.5 and 8.6, respectively. The effect of bat MOI was dramatic, while the effect of bat weight was clearly less. Fig. 8.5. Normalized swing speed as a function of bat MOI. Fig. 8.6. Normalized swing speed as a function of bat weight. The exponent, n, represents different assumptions allowing the idealized comparison. According to the various models, the exponent can vary from 0 to 1. An exponent of 0 indicates that speed is constant and not affected by MOI. An exponent of 1/3 assumes the batter has a constant power output. An exponent of ½ assumes the batter generates the same bat kinetic energy as MOI varies. An exponent of 1 assumes the angular momentum of the bat does not change as itsMOI varies. Unfortunately our understanding of the human body does not direct us toward any of these assumptions. It is for this reason that the field studies were conducted. One might expect, however, that an exponent of 0 would be too small, while an exponent of 1 would be too large. Not surprisingly, results from the field studies showed that the exponent varied widely between batters. A consistent trend was not observed, however, between the exponent and player strength or size. The average exponent was found to be 0.25 and 0.20 for the men’s slow pitch and women’s fast pitch field studies, respectively. The field studies were also used to compare the magnitude of the swing speed. The men’s slow pitch considered A and D batters from the 2002 National Championship, while the women’s fast pitch study considered NCAA Division 1, 2, 3, high school, and Olympic players from the 2004 National Championship. Both studies involved 34 inch long bats. Results of these groups are presented in Figs. 8.7 and 8.8, where the swing speed was reported at 6 inches from the end of the bat. Fig. 8.7. Average men’s A and D level slow pitch swing speed. Fig. 8.8. Average women’s Olympic, College, and high school swing speed. [e] S. Plagenhoef, Patterns of Human Motion, Prentice-Hall, New Jersey (1971). [f] G. S. Fleisig, N. Zheng, D. Stodden, and J. R. Andrews. Sports Engineering, 5:1-8 (2002). [g] J. J. Crisco, R. M. Greenwald, L. H. Penna, and K.R. Saul, The Engineering of Sport, Blackwell Science, A. J. Subic and S. J. Haake, eds. 193-200 (2000). [h] K. Koenig, T. Hannigan, N. Davis, M. Hillhouse, L, Spencer, NCAA Research Program on Bat and Ball Performance, Final Report, Providence, RI, 88-100 (1997). [i] Smith, L. V., Broker, J., Nathan, A., 2003. “A Study of Softball Player Swing Speed,” Sports Dynamics Discovery and Application, Subic, Trivailo, Alam, eds., pp. 12-17, Melbourne, Australia. [j] It should be noted that the motion of any object that has translational and rotational components of motion can be described by an instantaneous center of rotation. An object in pure rotation will rotate about its center. An object that is mostly in translation with have a center of rotation located far from it. The location of the instantaneous center of rotation will move as the magnitudes of rotation and translation change to describe the object’s motion in space.